26 “So I sent messengers from the wilderness of Kedemoth to Sihon the king of Heshbon, with words of peace, saying, 27 ‘Let me pass through your land. I will go only by the road; I will turn aside neither to the right nor to the left. 28 You shall sell me food for money, that I may eat, and give me water for money, that I may drink. Only let me pass through on foot, 29 as the sons of Esau who live in Seir and the Moabites who live in Ar did for me, until I go over the Jordan into the land that the Lord our God is giving to us.’ 30 But Sihon the king of Heshbon would not let us pass by him, for the Lord your God hardened his spirit and made his heart obstinate, that he might give him into your hand, as he is this day. 31 And the Lord said to me, ‘Behold, I have begun to give Sihon and his land over to you. Begin to take possession, that you may occupy his land.’ 32 Then Sihon came out against us, he and all his people, to battle at Jahaz. 33 And the Lord our God gave him over to us, and we defeated him and his sons and all his people. 34 And we captured all his cities at that time and devoted to destruction every city, men, women, and children. We left no survivors. 35 Only the livestock we took as spoil for ourselves, with the plunder of the cities that we captured. 36 From Aroer, which is on the edge of the Valley of the Arnon, and from the city that is in the valley, as far as Gilead, there was not a city too high for us. The Lord our God gave all into our hands. 37 Only to the land of the sons of Ammon you did not draw near, that is, to all the banks of the river Jabbok and the cities of the hill country, whatever the Lord our God had forbidden us. 1Then we turned, and took our journey into the wilderness by the way of the Red sea, as the LORD spake unto me: and we compassed mount Seir many days.2And the LORD spake unto me, saying,3Ye have compassed this mountain long enough: turn you northward.4And command thou the people, saying, Ye are to pass through the coast of your brethren the children of Esau, which dwell in Seir; and they shall be afraid of you: take ye good heed unto yourselves therefore:5Meddle not with them; for I will not give you of their land, no, not so much as a foot breadth; because I have given mount Seir unto Esau for a possession.6Ye shall buy meat of them for money, that ye may eat; and ye shall also buy water of them for money, that ye may drink.7For the LORD thy God hath blessed thee in all the works of thy hand: he knoweth thy walking through this great wilderness: these forty years the LORD thy God hath been with thee; thou hast lacked nothing.8And when we passed by from our brethren the children of Esau, which dwelt in Seir, through the way of the plain from Elath, and from Eziongaber, we turned and passed by the way of the wilderness of Moab.9And the LORD said unto me, Distress not the Moabites, neither contend with them in battle: for I will not give thee of their land for a possession; because I have given Ar unto the children of Lot for a possession.10The Emims dwelt therein in times past, a people great, and many, and tall, as the Anakims;11Which also were accounted giants, as the Anakims; but the Moabites call them Emims.12The Horims also dwelt in Seir beforetime; but the children of Esau succeeded them, when they had destroyed them from before them, and dwelt in their stead; as Israel did unto the land of his possession, which the LORD gave unto them.13Now rise up, said I, and get you over the brook Zered. And we went over the brook Zered.14And the space in which we came from Kadeshbarnea, until we were come over the brook Zered, was thirty and eight years; until all the generation of the men of war were wasted out from among the host, as the LORD sware unto them.15For indeed the hand of the LORD was against them, to destroy them from among the host, until they were consumed.16So it came to pass, when all the men of war were consumed and dead from among the people,17That the LORD spake unto me, saying,18Thou art to pass over through Ar, the coast of Moab, this day:19And when thou comest nigh over against the children of Ammon, distress them not, nor meddle with them: for I will not give thee of the land of the children of Ammon any possession; because I have given it unto the children of Lot for a possession.20(That also was accounted a land of giants: giants dwelt therein in old time; and the Ammonites call them Zamzummims;21A people great, and many, and tall, as the Anakims; but the LORD destroyed them before them; and they succeeded them, and dwelt in their stead:22As he did to the children of Esau, which dwelt in Seir, when he destroyed the Horims from before them; and they succeeded them, and dwelt in their stead even unto this day:23And the Avims which dwelt in Hazerim, even unto Azzah, the Caphtorims, which came forth out of Caphtor, destroyed them, and dwelt in their stead. )24Rise ye up, take your journey, and pass over the river Arnon: behold, I have given into thine hand Sihon the Amorite, king of Heshbon, and his land: begin to possess it, and contend with him in battle.25This day will I begin to put the dread of thee and the fear of thee upon the nations that are under the whole heaven, who shall hear report of thee, and shall tremble, and be in anguish because of thee.26And I sent messengers out of the wilderness of Kedemoth unto Sihon king of Heshbon with words of peace, saying,27Let me pass through thy land: I will go along by the high way, I will neither turn unto the right hand nor to the left.28Thou shalt sell me meat for money, that I may eat; and give me water for money, that I may drink: only I will pass through on my feet;29(As the children of Esau which dwell in Seir, and the Moabites which dwell in Ar, did unto me;) until I shall pass over Jordan into the land which the LORD our God giveth us.30But Sihon king of Heshbon would not let us pass by him: for the LORD thy God hardened his spirit, and made his heart obstinate, that he might deliver him into thy hand, as appeareth this day.31And the LORD said unto me, Behold, I have begun to give Sihon and his land before thee: begin to possess, that thou mayest inherit his land.32Then Sihon came out against us, he and all his people, to fight at Jahaz.33And the LORD our God delivered him before us; and we smote him, and his sons, and all his people.34And we took all his cities at that time, and utterly destroyed the men, and the women, and the little ones, of every city, we left none to remain:35Only the cattle we took for a prey unto ourselves, and the spoil of the cities which we took.36From Aroer, which is by the brink of the river of Arnon, and from the city that is by the river, even unto Gilead, there was not one city too strong for us: the LORD our God delivered all unto us:37Only unto the land of the children of Ammon thou camest not, nor unto any place of the river Jabbok, nor unto the cities in the mountains, nor unto whatsoever the LORD our God forbad us. 1What advantage then hath the Jew? or what profit is there of circumcision?2Much every way: chiefly, because that unto them were committed the oracles of God.3For what if some did not believe? shall their unbelief make the faith of God without effect?4God forbid: yea, let God be true, but every man a liar; as it is written, That thou mightest be justified in thy sayings, and mightest overcome when thou art judged.5But if our unrighteousness commend the righteousness of God, what shall we say? Is God unrighteous who taketh vengeance? (I speak as a man)6God forbid: for then how shall God judge the world?7For if the truth of God hath more abounded through my lie unto his glory; why yet am I also judged as a sinner?8And not rather, (as we be slanderously reported, and as some affirm that we say,) Let us do evil, that good may come? whose damnation is just. 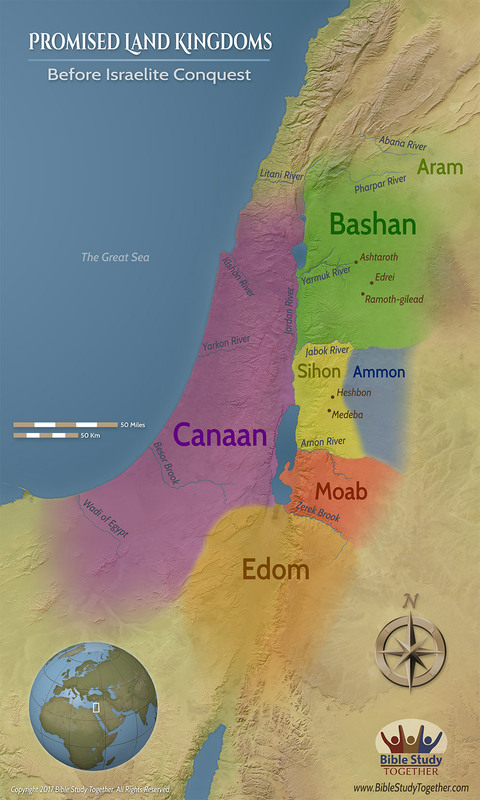 How did God go before the Israelites in taking possession of the land? Why didn’t Israel attack the Edomites, the Moabites, and the Ammonites? How does Paul explain that “the end doesn’t justify the means”? How has God provided for you through a wilderness? Initiate a conversation with others about the faithfulness of God in your life.